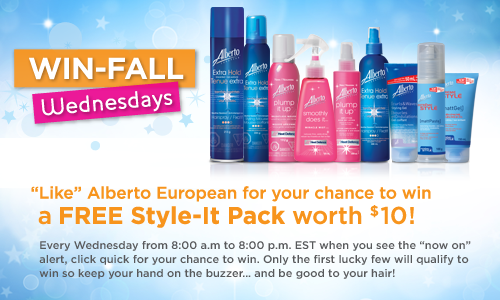 Every Wednesday Between 8:00 AM – 8:00 PM Until December 28th Alberto European will be giving away a limited number of Style-It Packs! There is no set time for this to take place so it’s basically luck if you happen to catch it! You will see a “Now On” Alert and then you gotta be quick and hopefully you will be one of the lucky winners!! Click Here To Like Alberto European for your chance to win 1 of 50 Alberto European Style-It Packs From Now Until December 21st and the last week December 28th there will be 100 available! If You Like This Post, Share With Your Friends & Don’t Forget To Join Samples N Freebies N Deals On Facebook!